Pope Francis has publicly urged Catholics to receive the sacrament of penance and reconciliation, or confession, reminding them that “we are all sinners” and the shame associated with sin is “a grace” that prepares them for God’s forgiveness. Despite the pontiff’s entreaties, only about four-in-ten U.S. Catholics (43%) say they go to confession at least once a year and 28% say they never go, according to Pew Research Center’s most recent survey of U.S. Catholics. And yet, this lukewarm embrace of confession does not reflect a disbelief in sin: Roughly nine-in-ten U.S. Catholics (89%) do believe that some actions are offensive to God. Indeed, most American adults (78%) believe the same, including 91% of Protestants. At the same time, however, many American Catholics do not agree with church teachings on what constitutes sinful behavior in several areas. For instance, the recent Pew Research survey finds that U.S. Catholics are divided on homosexual behavior, with 44% saying it is sinful and 39% saying it is not – a figure that rises to 51% among Catholic adults under age 30. And majorities of Catholics say that living with a romantic partner outside marriage (54%) and getting a divorce (61%) are not sinful. About half (49%) say remarrying after a divorce without first obtaining an annulment is not a sin. 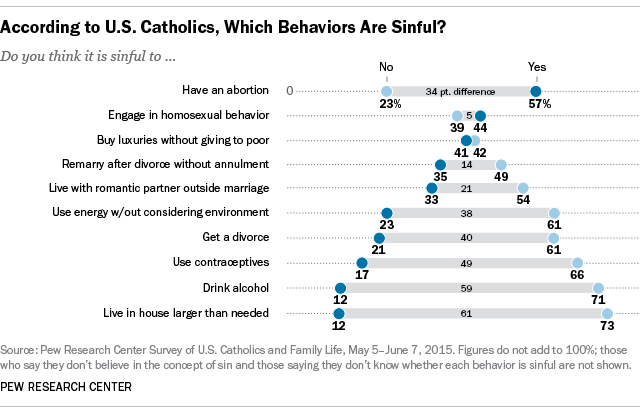 In addition, fully two-thirds of U.S. Catholics (66%) say using artificial birth control is not a sin. Even 57% of the most devout Catholics – those who report attending Mass at least weekly – say using contraceptives is not wrong. Those who attend Mass weekly or more are divided over the sinfulness of cohabitation (46% say it is sinful, 45% say it is not). But these Catholics also are more likely to agree with church teachings when it comes to abortion and engaging in homosexual behavior: 73% and 59%, respectively, say these are sins. Indeed, a majority of all Catholics, regardless of whether they attend Mass regularly, say abortion is sinful (57%). The pope has challenged Catholics to consider how their lifestyles harm the environment and how they can help the poor, but he may have some convincing to do during his U.S. visit this week. According to the latest Pew Research study of U.S. Catholics, 42% say buying luxury goods without giving to the poor is not sinful. And even larger shares say living in a house much larger than needed (73%) and using energy without considering its impact on the environment (61%) are not sins.